Getting ready for the solar eclipse coming to the USA this August, I bought a solar filter for my Infinity 80. Naturally, when it was delivered today, it was raining. It does, however, fit the Infinty 80 perfectly, with a little foam strip that came with the filter installed inside the rim. This filter is the white light filter now being sold by Meade. The number 400 filter fits my scope over the end of the dew shield, with a thumb screw to tighten to the shield. Later this afternoon, the clouds to the west end of the cloud deck cleared out some and the sun started shining through. Eager to try out the filter, I took the telescope out front on the drive way. The sun itself showed to be totally free of sunspots when I finally got a look at it. The really fun part was having the top of the sun disk being blocked out by the edge of the cloud deck, that was moving slowly in one direction, and some thinner clouds toward the bottom of the disk, moving in the opposite direction. The view was totally captivating. All kinds of swirls could be seen in the clouds themselves as they moved by the sun's disk and the image was very high contrast, like an X-ray film. I was pretty much trapped with the view, until my back started aching as I was leaning over the scope, rather than sitting in my astronomy chair. I have a new perspective on clouds during the daytime! I will now be looking for opportunities of watching clouds go by the sun. I have taken the Infinity 80 out a couple more times with the solar filter on it. I am getting a really crisp, I think, image of the sun. Unfortunately, any sun spots have become shy. At times, I seem to be seeing the very beginning of the gas streams that head out from the sun along magnetic lines. What I am seeing is very faint and goes away after must a little glimpse, so it may not be the real thing and bits of clouds. However, I am thinking that these little lines are coming straight out from the solar disk, that they are really solar in origin. Along with the glass filter in its aluminum housing, they provided two strips of foam with a sticky surface on one side, each piece being a different thickness for different scopes. The thin one worked nicely for the Infinity 80. I just have to fit the filter over the end of the dew shield and tighten the thumb screw down some. 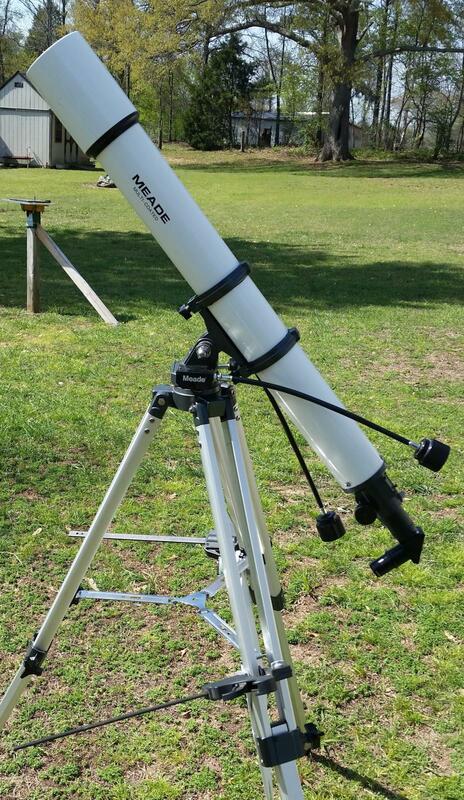 I remember as a young teen in the early 70's using my Sears Discoverer refractor and looking at the Sun with projection on the screen. 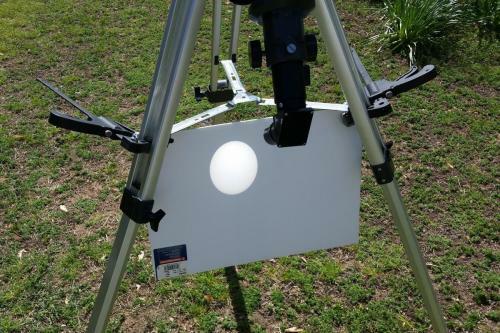 It was a simple method to see a few sunspots. I have seen pictures of refractor setups with a little white screen attached to the eyepiece end of the scope that could be swung in the way to see the sun. Looks like it could be fun! That's a great way to share the view. And, the farther away you place the screen the larger the image gets. Here's my Meade 90mm setup. I may have to rig up something like that. Well apart from getting a hydrogen alpha 'scope, I find the Baader filters much better. To show at outreach events, a webcam and laptop screen works well.